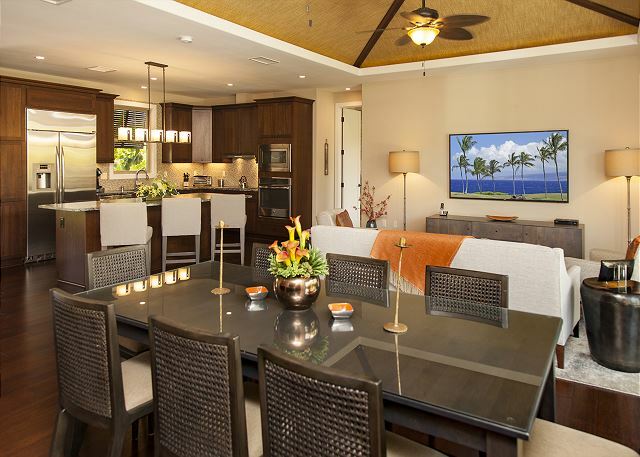 Welcome to KaMilo, the upscale private community of luxury homes in the exclusive Mauna Lani resort community on the Big Island of Hawaii. 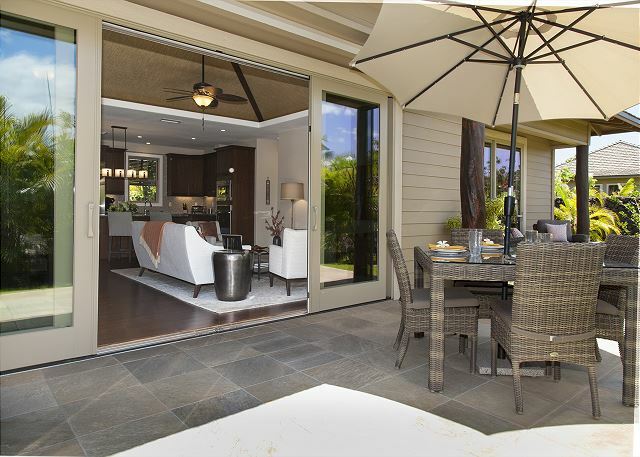 This luxurious single story Cottage home boasts an open floor plan with an expansive great room, vaulted ceilings and lanai doors enabling you to bring natural outdoor beauty inside. 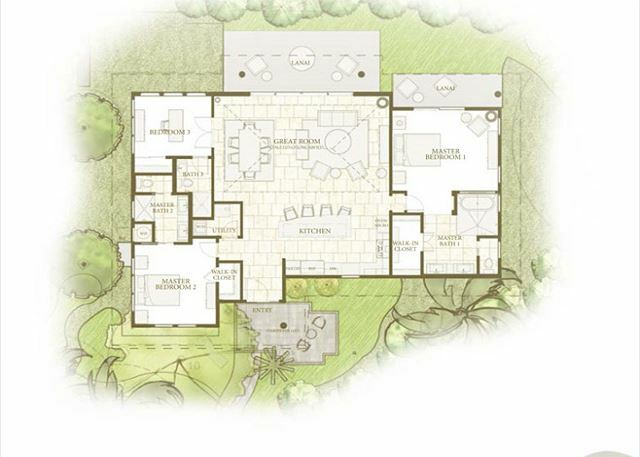 This floor plan is equally well suited to entertain large groups as well as provide a tranquil haven to recharge your spirit. Each bedroom has its own ensuite bathroom making this a perfect home for large families, couples or friends traveling together. - Large lawn for activities like throwing a Frisbee, tossing a football, etc. Our home is not the typical rental home as we use this home as our own private retreat several times per year. 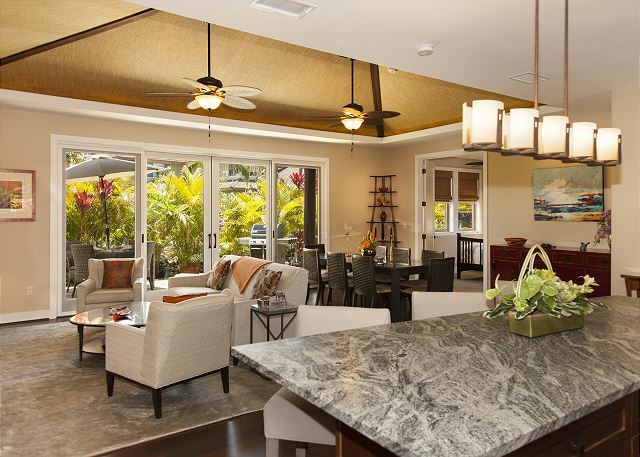 Therefore rather than treating this as “a rental”, we decorated this home to our own standards and furnished it with high quality amenities, furniture and artwork so we can create many lasting memories for years to come. We love sharing our home with others and hope that you can enjoy our home and the wonderful KaMilo community as much as we do. Mahalo nui loa! Home was beautiful. Location was great. Resort itself was fantastic -fun restaurant, good beach area. Really, couldn’t have been nicer. One of the best vacation rental homes we have ever stayed in. Very close to the pool, beach toys for kids. 3 nice bedrooms with their own dedicated bathroom. Perfect for families. We will definitely be back! We loved staying at this property. It was clean, comfortable, and provided everything we needed. We hope to be back! Perfect for our family of five. Room to spare. Great location - close to beaches, grocery store and pool. This neighborhood was nice and new. Had slight issue with unit not being fully cleaned upon arrival. Sent a cleaner over while we were out but we didn't notice a difference. Overall, great stay on an amazing island. The house was perfect. The space itself allowed privacy for three adults which was great. The amenities it offered were beyond what we expected from the description and pictures. We could not have asked for more. We also enjoyed relaxing massages on the private lanai by a licensed massage therapist, Bonnie, from a nearby facility. / Such a wonderful and relaxing time under the starlit Hawaiian skies! This is a very nice three bedroom home. Fairly new with everything in good working order and a nice selection of beach toys. The yard is quite small but private and nicely landscaped. As advertised it is very close to the community pools which are large, well maintained and peaceful. Kitchen and baths are good. The house was spotless on entry but there are a few stains on carpet and area rug in the living room. We had no issues but the management company seems well organized and responsive. we had a family reunion over New Years at Mauna Lani. Ideal location although the hotel was closed for renovations. Very comfortable, quiet condo, close to restaurants and activities!!! I would stay here again in a heat! This beautiful, spacious house was perfect for our family. We enjoyed spending time in the open plan living room and kitchen, and the house was well stocked with everything we needed for a fun and relaxing stay. It was a two minute walk to the pools and close to a great little grocery store. Our vacation rental was immaculate and was absolutely perfect for our stay. We enjoyed the spacious living room and patio and had many meals just relaxing at home. This location is fantasic, near beautiful beaches, resorts, shopping, food. Couldn't have been better. Very pleasant experience and always impressed by the upkeep of the place. Very relaxing stay and will be our first choice again in Mauna Lani. This Ka Milo unit was absolutely wonderful! Once you come around the corner from the driveway/garage, it appears like a little oasis tucked away with a couple other stand-alone units surrounding a shared yard/courtyard. The description is spot on and the reality is even more impressive. It is clean, roomy, comfortable and well stocked from kitchen needs to linen and various other amenities. 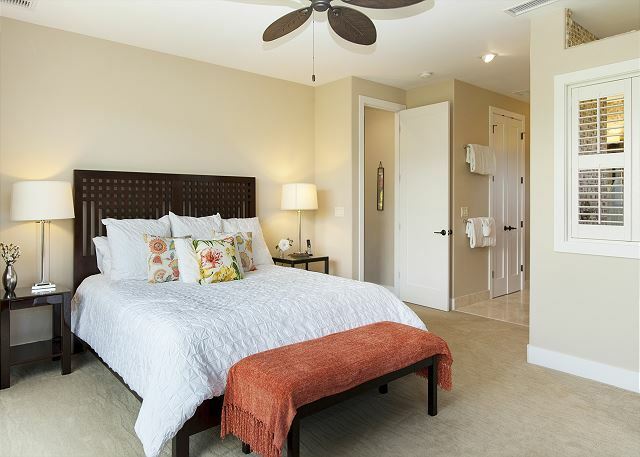 Each room has its own bathroom that are stunning furnished as to is the dining/living/patio area. We also took advantage of the recreation center (2 pools, 2 jacuzzi's, and well-stocked gym). 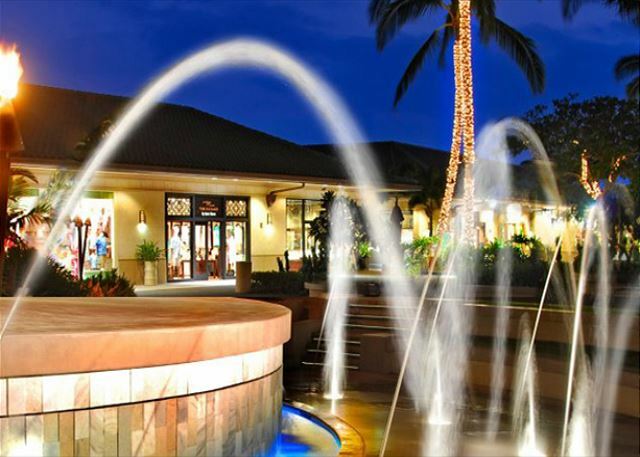 The Maunalani shops - including a grocery store and deli, coffee shop, restaurants, and retail shops are a 3-minute drive away. 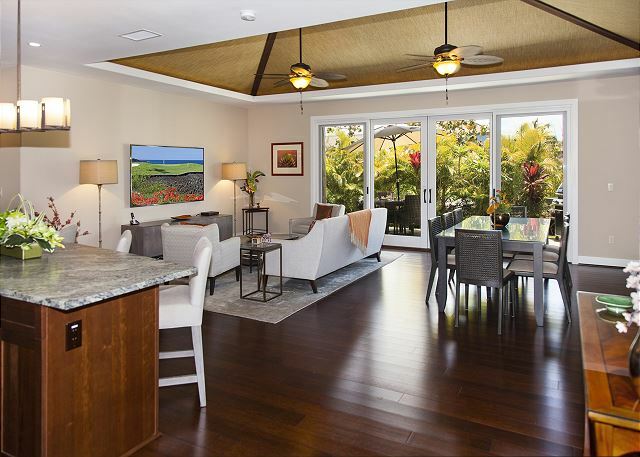 There are of course more restaurants within the Maunalani area, all of which are no more than a 5-min drive from your covered/secured garage. Shig the property manager was extremely helpful and accessible. We look forward to being able to stay at Ka Milo again! I have stayed here twice and will be back again! Wonderful home with everything you could possibly need.The location is fabulous with just a short ealk to the gorgeous pool area and gym or a short drive to the beach and restaurants. The management is very helpful with suggestions for day trips or outings. We stayed with my wife, 18-year old son and 84-year-old mother. I really like the layout of the house because everybody had their own space. The location is great too. I'm a runner and really enjoyed a 5-mile loop around the resort and beaches. This house is exactly as described; clean, well kept and pretty well stocked. It is in a great location for quick sight seeing on the North side of the Island and Waimea (one of our favorite places to go when we visit). 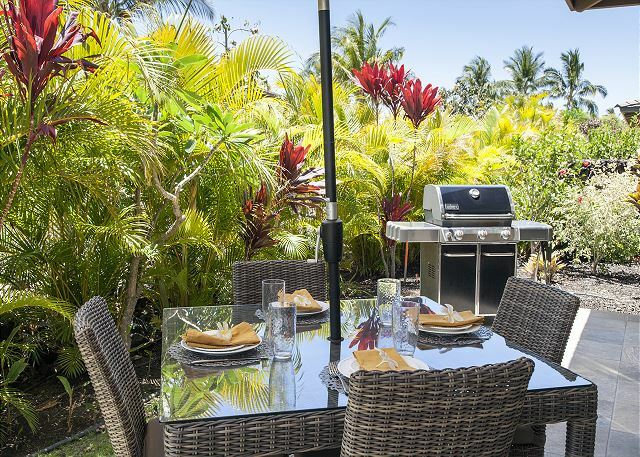 We love that the Foodland grocery store, Tommy Bahama Restaurant, the beach side restaurant at the Fairmont and the Shops at Mauna Lani are an easy walk away. Waikoloa Village and the Kings/Queen's Shops are just a 2 minute drive. We love the free Hula and music shows put on in both the shops in Waikoloa and Mauna Lani. One caution: there are no sidewalks in the neighborhood, to the shops at Mauna Lani or the Fairmont and the streets are dark at night. Walking on the shoulder made us nervous, especially with little ones so just be careful and bring the flashlights provided in the house. The neighborhood is very quiet & the backyard space feels private despite the homes being so close together. The pool area is beautiful and perfect for kids but the pool is COLD which was really disappointing given the monthly HOA fees the owners pay. We appreciated the kitchen being stocked with just about anything you might need. The refrigerator has water/ice which we loved!! We definitely recommend this house for families!! You will love it! Shig is great to book through; very responsive, kind and helpful. If the house layout ever changes to 2 King beds with the 2 twins, we will certainly rebook and give it a 5 star rating! The place we stayed in a gated community was immaculate!! We absolutely loved the home and all it had to offer!!! Our only complaint was that we had inquired several times via phone and email for three days to get the code to the gate of the property and was unable to receive a response. There were several times we had to wait for another car to come along before we could drive through the gate and get to the house. We were stressed aboutt the code because we had a guide coming to pick us up at 3:00a.m. Luckily, a few hours before he arrived we finally got the code. Great Time at Keanu Cottage! We totally enjoyed our visit. KaMilo 414 was super!! We actually rented two of the Shiwota properties as there was 4 couples and 2 infants travelling together. 414 became the focal point as it was easily able to accommodate us all at meal times. The property description was perfect. It was very well maintained and clean as a whistle. Shig and his team were great - immediate response to any questions and the special needs that go along with traveling with infants (cribs etc). There are two pools, two hot tubs, and a decent fitness centre as part of the complex for use which is also well maintained. It has a big grassy area and a covered kitchen and eating area if you want. There is a shopping mall that you can walk to or take a 3 minute drive with a decently stocked grocery store and several other shops. I would highly recommend this place for your next visit to Kona! 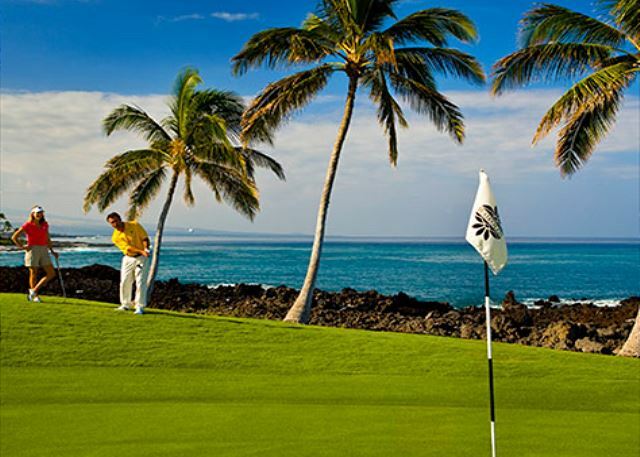 Check out Tommy Bahama's Restuarant right in Mauna Lani and down the road a ways try the Lava Lava Beach Club in Waikoloa Village for a sunset dinner!! Also, VERY windy while we were there and the beach by Lava Lava (Anaeho'omalu Beach) was sheltered quite well from the North winds. It's a state park so public access. Beautiful, brand new home in a secluded gated community! My family of six stayed in this beautiful and brand new home in Oct 2017. It's a big, beautiful and brand new home, with a nice plantation style backyard. It has A/C as well. The front yard is very pretty with a nice hammock for us to relax. Grocery, shopping and other amenities are close by. The private beach is a short drive from the cottage and very well maintained. The beach has soft sand, nice walking trails and a cove where you can see lots of colorful fish. Will definitely stay here again! We loved staying in KaMilo 414. It was very well maintained. The cottage is beautiful with all the comforts of home. We had everything we needed to cook at home. There is a coffee maker and a Keurig, plenty of beach towels, beach chairs, a cooler, beach toys, etc. The management left some delicious cookies and coffee for our arrival which was great after a long plane ride. 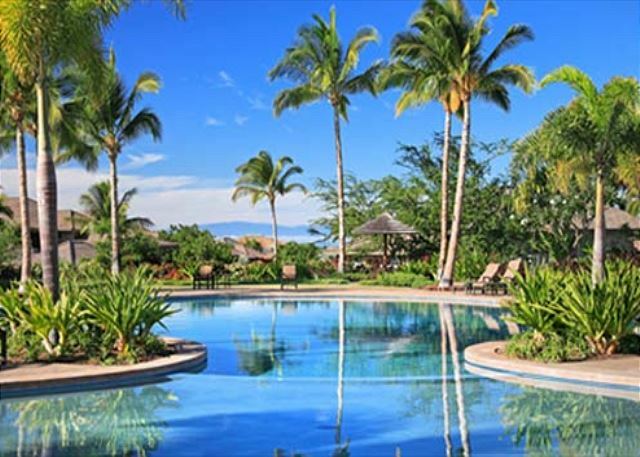 Mauna Lani is a great location and we really enjoyed the private beach with cabanas and a great open air restaurant. There are some really unique fishponds and petroglyphs in the area and plenty of cute shops and a grocery store nearby. We took a day adventure to Volcanoes National Park and a night trip to Mauna Kea for stargazing both of which I would highly recommend. The Big Island is a very unique place and there are a lot of interesting things to see and do. I would definitely recommend this location and property. Perfect accommodations for our family (four adults, one three-year-old.) Shig, the property manager, was very helpful and quickly took care of the few minor issues that did arise. Lovely pools on the KaMilo property, and the nearby Beach Club beach was the best one we found. This property is sublime in decor and condition. Each time we thought, "we could use a...," there it was! We are all thinking of a repeat stay. We loved the location and the house. Nice floor plan and nicely decorated home. The home was well stocked and clean. We really enjoyed this unit and look forward to returning next year! Shig is a wonderful property manager. Our unit was excellent, lots of room, beautifully appointed, great location. We had a fantastic time. Will definately come back. So far the best vacation rental experience I've gotten to experience. Everything from the kitchen, bathrooms and bedroom were well prepped and equipped for us to move right in. The kitchen had all the utensils, baking, cooking and grilling accessories available. We didnt have to worry about getting much to make our stay feel like we didnt leave our own house. The only hiccup I saw was the large pool was green and dirty. Luckily there was another pool by the fitness room to swim in. Much mahalos to Shiwota and Team for making this an awesome place to stay during our racecation. The house was immaculate! Beautifully furnished with all the bells and whistles. A very close walk to the pool and a short drive to the shopping complex. A very comfortable place to stay - difficult to leave! I have dealt with Shiwota Resorts & Properties for three years (rentals for both business and pleasure) and they are fantastic. 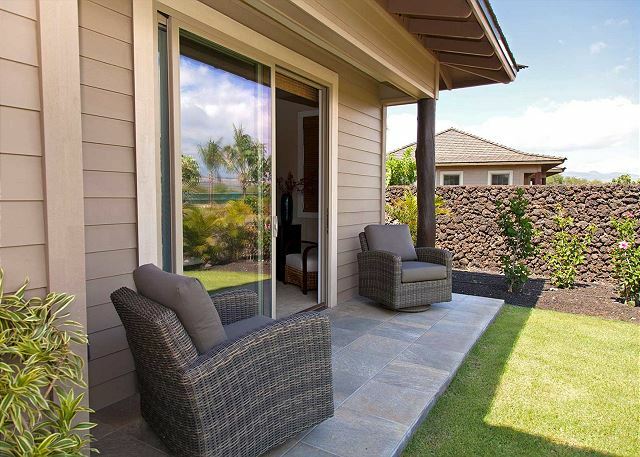 This home was perfect for our vacation and Mauna Lani is one of our favourite locations. Everything you need is at the house and as a stand alone villa it was very quiet. We will definitely be back! Thank you Shig and Maya! This lovely house is super comfortable, beautifully decorated with high-end furnishings and equipment. This house is very clean, walking distance to shopping and beach and to the recreation center - we had a really great time staying there. The property owner, Shig, was great, very responsive and had just the correct amount of contact. We would not hesitate to recommend this property to friends nor would we hesitate to rent this property again. 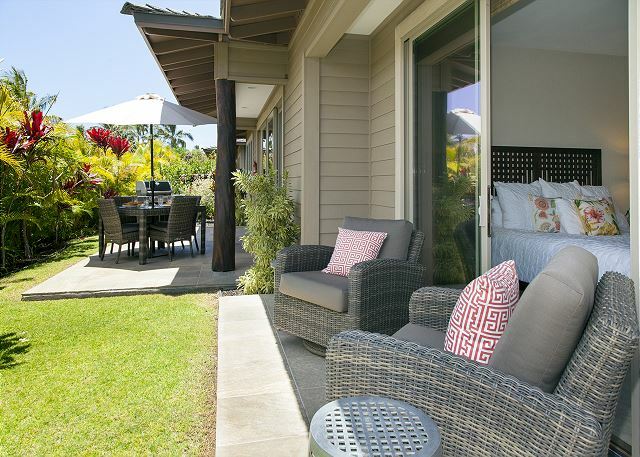 We loved staying here and have made it our #1 choice when we race Ironman World Championships. Shig is great and super helpful always! My husband and I were incredibly comfortable during our one week stay at KaMilo 414 and definitely recommend this unit to anyone looking to rent in this complex. A big thank you to the owner Shig, whose professionalism, hospitality and attention to detail in the unit made our stay incredibly comfortable. We enjoyed the contemporary decor, the comfortable bed in the master bedroom, the fact that plenty of towels were made available. The master bathroom with the walk in shower, twin sinks and very cool, but unusual pod bathtub are totally unique. 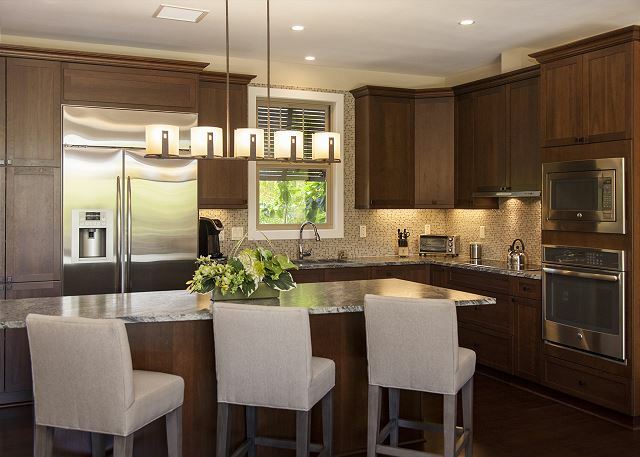 The kitchen offers plenty of room for cooking and even had a Keurig coffee maker. The unit is very close to the pool, where the adult lap pool is a total plus. We loved that the back yard is covered with folliage and would have liked to use the grill, but had too much fun eating out at various restaurants. Shig and his wife Maya made themselves available, totally welcomed us and even have an app which make the whole renting process seamless. 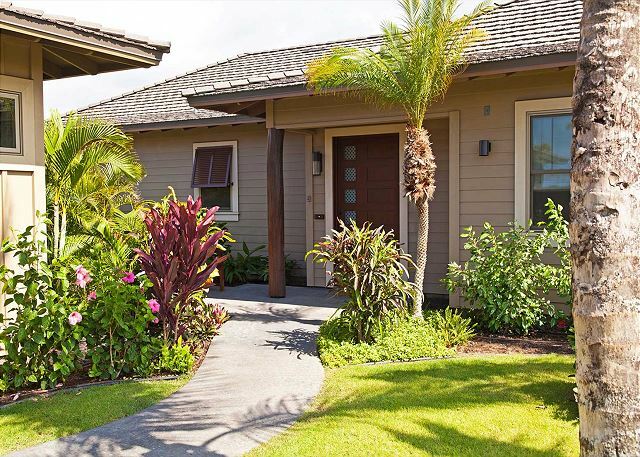 We come back to the Big Island every year and would definitely rent this unit again. We had a pleasant stay. The only inconvenience was the lack of parking space at our rental place and the sprinklers spraying on the sidewalks & driveway. We really enjoyed staying at this unit because of the modern furniture, the spacious layout and unique decor with nice outdoor patios to relax on as well. Everything was perfect! This home is not only beautifully furnished and appointed it is also very warm and comfortable. All three bedrooms spacious and comfy all with beautiful bathrooms. The "cottage" experience was special as it felt very private yet pools and other amenities were very available. Hammock in front-a lovely bonus! We had a wonderful stay in this well appointed, well equipped house. It was conveniently located to a beautiful beach and shopping. 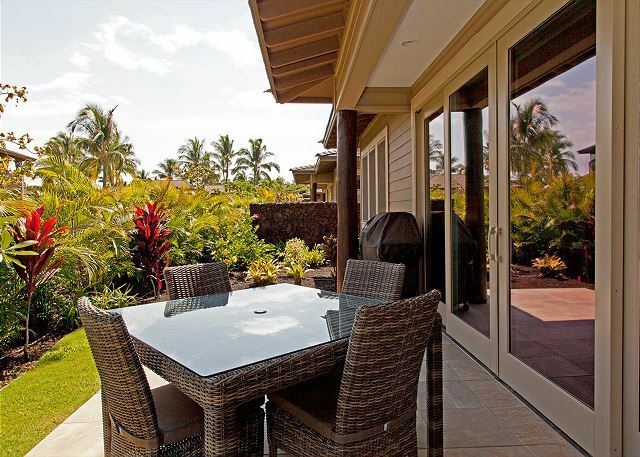 We had breakfast and dinner on the lanai.